Bonvista Financial Planners: Nifty breaks out of range - What next? Nifty breaks out of range - What next? Last week we had mentioned about a range between 8970 and 9270. The Nifty was trading in this range. We had also mentioned that Nifty has to break out of this range on either side to get a clear direction. 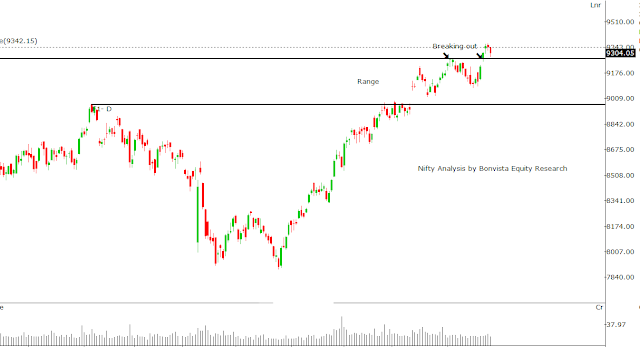 Nifty broke upper level of the range on 25th Apr. We can safely assume that Nifty is on its way to continue its journey Northwards, unless some bad news comes in. Broadly Nifty is in bull run and is expected to continue with it. Every correction is a buying opportunity in Nifty. After breaking out of 9270, Nifty has corrected a bit to test the level again. We can assume Nifty to bounce again from this level. If Nifty breaks below 9270, the next immediate support is near 9220. Both these support levels are buying opportunities in Nifty.